This is also what sets it apart from your average sport. Most sports are a function of repetitive movements that can often cause repetitive stress on the body or tightness in certain areas because of the posture adopted during that specific sport. In yoga it is said that “you are only as old as your spine.” In other words, as long as you have a healthy and flexible spine, your ability to participate in life is endless. The spine is your vitality; it houses all the nerves that keep your muscles and organs functioning optimally. It is also the home of the central channel or “Shushumna Nadi” in the yoga tradition, which is where we hold our “Prana” or life force. For the spine and joints, gravity is not always our friend. It causes wear and tear over time, loss of height, osteoarthritis in the joints and loss of mobility. Imagine what the possibilities would be if we could open the spine in every direction without compression, in other words in a state of traction. The only way to do this would be to practice while hanging upside down. Impossible? Not so. The Great Yoga Wall ™ makes it possible. What is a Yoga Wall? 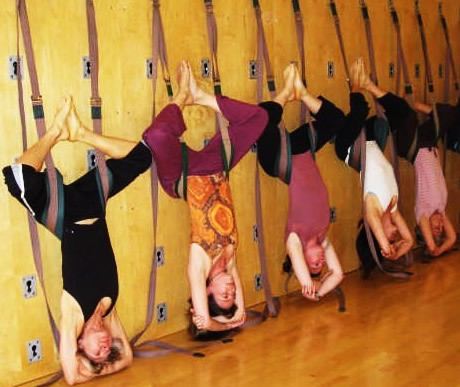 The Yoga Wall has been around for decades, originally designed by BKS Iyengar in the form of ropes attached to wall hooks to assist students in various yoga asana (poses). The Great Yoga Wall ™ is a newer version of this wall with a system of adjustable straps and more comfortable pelvic swings to accommodate every height and body type. The new system was designed by Kedric Wolfe in the early 80’s after he injured his foot on one of the older system’s wall hooks. It occurred to him that there must be a “better way” to use the wall with more ease and versatility. She says that many of her private physical therapy clients have been able to avoid surgery and recovered from herniated discs with the help of the Yoga Wall. There are hundreds of poses that can be practiced with the help of the Yoga Wall system. At Embody Yoga and Physical Therapy Centers in San Diego, we teach special sequencing including one called “Rejuvenation of the Spine Series.” The series, which is taught by Purna Yoga ™ co-founder and Yoga Master, Aadil Palkhivala, incorporates flexion, extension, lateral flexion and rotation all while the spine is in traction. The beauty of the system is that the traction begins at the low back compared to inversion tables which first traction the ankles, knees and hip before reaching the spine. The Yoga Wall uses positioning, action, breath and awareness to open the spine and joints. Other poses that are practiced on the wall include standing postures, forward bends, back bends, twists and inversions such as headstand, which can be done without any weight on the head. Long time student and physical medicine physician, Dr. Lance Stone, said he liked it so much, he installed one in his house. Once you have tried the Great Yoga Wall ™, it is hard to resist coming back. It is unlike anything you have experienced. The only side effect I have seen is a smile that won’t go away. Rachel Krentzman, RPT, E-RYT is the Cofounder and Director of Embody Yoga and Physical Therapy, a charming studio with a full Yoga Wall system in the heart of Bird Rock, in San Diego CA. She is a licensed physical therapist and a certified Purna Yoga Instructor who is passionate about integrating Yoga into Rehabilitation. For information on the Great Yoga Wall ™ visit www.yogawall.com.